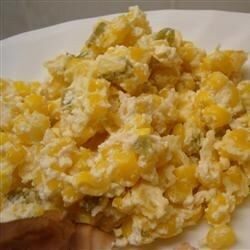 "This corn casserole has been a hit wherever I've taken it." 1Preheat oven to 350 degrees F (175 degrees C). Spray a 9x9 inch casserole dish with cooking spray. 2In a mixing bowl, combine cream cheese and milk until smooth. Stir in corn and jalapeno peppers. Transfer mixture to the prepared dish and cover with a lid or foil. 3Bake in a preheated 350 degrees F (175 degrees C) oven for 40 to 50 minutes.